I made some bread yesterday and took this photo while it was "singing." 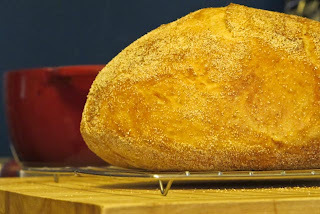 You can see a little bit of steam rising from the bread. Well, I could in the original photo; it kind of gets lost in the JPEG compression. Right after I take it out of the oven, the crust starts cooling and shrinking. The warm bread inside is creating steam, which escapes through the small cracks. You can actually hear it cracking, which is where the singing comes from. I found out that this is actually part of the baking process so you shouldn't cut open artisan bread immediately after taking it out of the oven. While the bread was baking, I was working on computers downstairs--go figure. This set up was unique enough that I decided to share it. 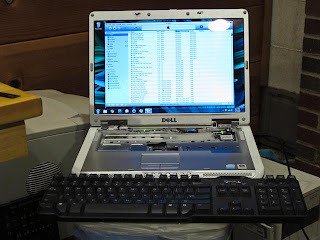 The laptop keyboard isn't working quite right so I took it off and started using an external USB keyboard. A replacement keyboard is on its way.